Champagne is one of the most recognized drinks in the world synonymous with celebration in almost every country on earth. By French law Champagne can only be produced within the Champagne Region of France. All other bubbly wines are called Sparkling Wine. 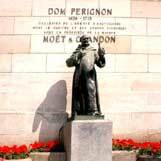 We all owe a special tribute to a Benedictine monk named Dom Pérignon (1638-1715) from the small town of Hautvillers just outside of Epernay, who introduced features that are hallmarks of Champagne today, such as the extensive blending from multiple vineyards. Some debate whether he invented Champagne itself, or the technique of adding sugar and yeast to still wine after fermentation to cause the wine to form bubbles. Champagne is considered a white wine, but it is made from a blend of both red and white grapes. The red grapes come from the Montagne de Reims (the mountains south of Reims) and the Valle de la Marne (the valley of the River Marne, where Epernay is located). The white wines come from the Cote des Blancs, just south of Epernay. These vineyards are the northern-most in France and that makes it difficult to grow grapes. This combined with the extra labor involved in production pushes the price of champagne higher than many other wines. The chalky soil unique to this area helps keep vines warm in cold weather while underground maintaining a consistent temperature for the hundreds of miles of natural caves where the champagne is produced and stored. Since the word champagne itself implies something luxurious, the major wine producers have very large and elegant cellars for the public to tour, taste and make purchases. Some individual cellars can be visited in the heart of the vineyards, but most that are open to the public can be found in Reims and Epernay. Note that many of these cellars have limited hours and that an appointment is strongly suggested, if not required. Because the cellars are below ground and tours often last over an hour, it is important to dress warmly. Most tours and visits have a charge which may or may not include a tasting. Expect to pay between $8 and $25 for a 90 minute tour with tasting. There are strict controls that the region has set for the process of making this world renowned wine. The grapes are pressed as near to the vine as possible. Most towns in the region have pressing- houses for this purpose. The grapes can only be pressed up to five times. The first 2-3 pressings are very light and rapid. The juice that comes from these pressings is used to make Champagne. This is known as cuvée. 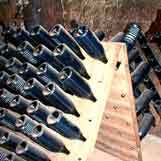 Any additional pressings results cannot be used in Champagne. Next the juice from these first pressings is brought to the winery for fermentation. After fermentation the red and white grapes are blended. Next the juice is bottled with a little sugar and wine yeast to create the bubbles during a second fermentation. This last process causes a deposit in the wine bottle which would ruin the champagne so it will eventually be removed. To help with this removal the bottles are stored standing upside down, with the cork facing the floor. Each day the bottles are turned to help the sediment settle near the neck. Once the the sediment has settled, the neck of the bottle is frozen. The cork is then removed and the pressure of the bubble forces an ice cube containing the sediment to shoot out of the bottle. At this point, wine, syrup and or sugars are added to give that particular champagne its distinct flavor. Then the bottle is corked again and labeled. Most champagnes are then aged in the cellars of the region for about three years, another factor adding to the overall cost. So now that you know the process, you might understand what Dom Perignon meant when he called to his fellow brothers after sipping his first creation: "Come quickly, I am tasting the stars!". Aren't you ready to hear that "pop" that accompanies celebrations? Salute! Please also visit our page about wine tasting in France.